Planetary geologists are still struggling to understand the huge volcanoes and giant valleys that dominate the Martian topography. However, it’s the martian environment that really fires most people’s imagination. Mention the martian environment to most people and they immediately think “Water !”, especially after the new Odyssey results about permafrost were announced in the general press recently. 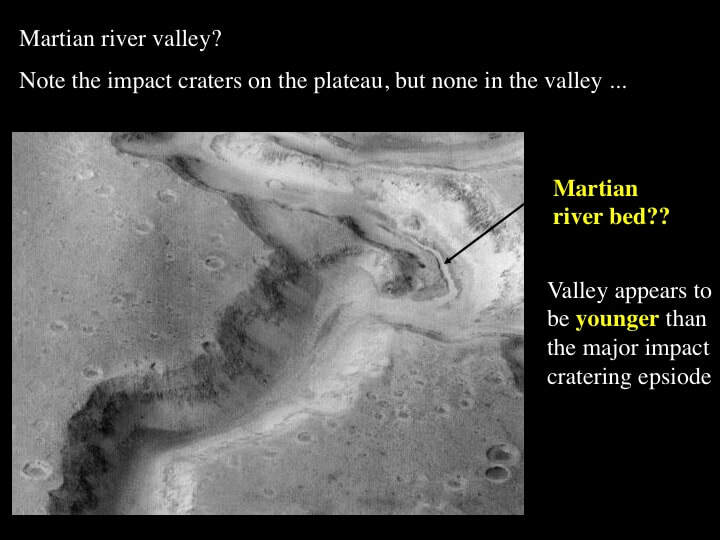 So let’s look at the geological evidence for surface water on Mars. Mars is divided into ancient Heavily Cratered Highlands in the South, and the Northern Plains that must be relatively young because they have so few impact craters. Some have speculated that the Northern Plains represent planet-scale resurfacing of the northern hemisphere when a huge volume of basalt magma erupted to fill what they interpret to be the largest impact basin in the Solar System, several orders of magnitude larger than the Hellas Basin in the Martian southern hemisphere. 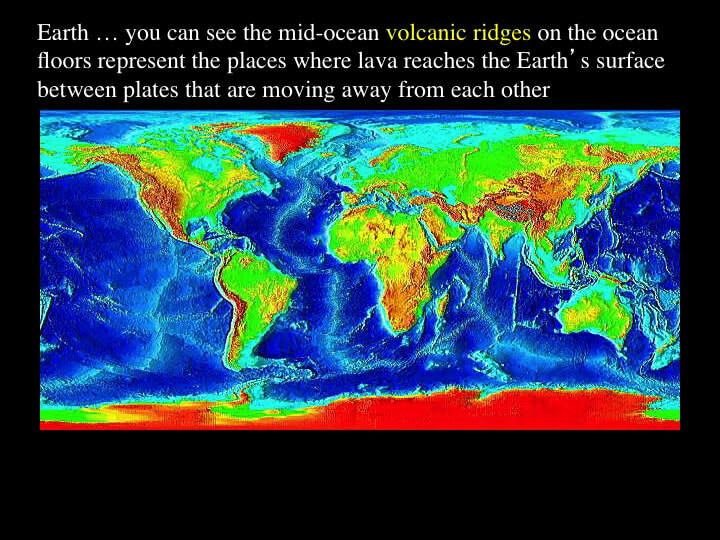 Others have speculated that the Northern Plains represent the floor to an ocean basin, just like basaltic ocean floors on Earth. Recently, some planetary geologists got really excited when one of the orbiters found magnetic stripes in the southern hemisphere (see below), because magnetic stripes in terrestrial ocean floors provided the first confirmation of plate tectonics on Earth. On Mars, the orbiter found something similar, and some people jumped to the conclusion that magnetic stripes mean plate tectonics, ocean floors, and therefore ocean water ! 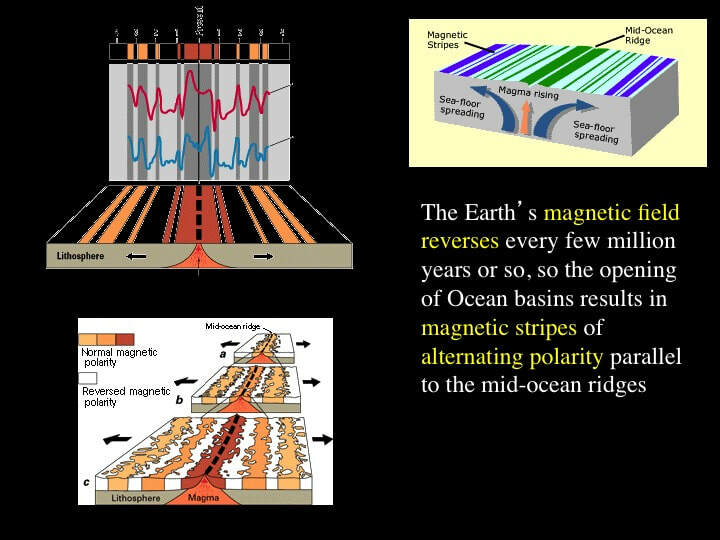 However, if you take a good look at the martian magnetic stripes, they are not symmetrical, whereas they should be according to the plate tectonics model. Therefore, I do not see any evidence for a martian mid-ocean ridge from which the two halves of an ocean floor would have grown as the planetary magnetic field reversed every once in a while. However, there’s much better geological evidence for surface water on Mars, without speculating about planetary oceans. The big debate these days is just how young these features, potentially created by running surface water, really are. Are they billions of years old, or could they represent geologically very young features, perhaps as young as 10 million years old ? ​There’s not much doubt that some channel systems are ancient. 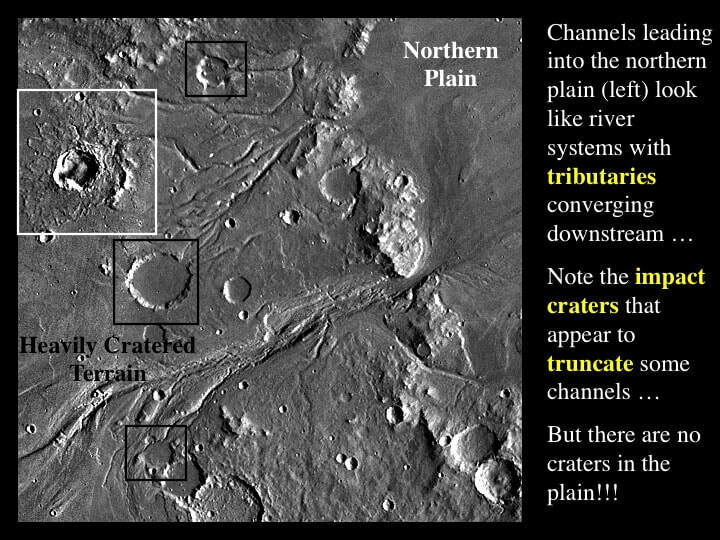 Some impact craters appear to truncate the upper reaches of channels, suggesting that the channels are older than ~3.8 billion years, because the great meteorite bombardment is thought to have ended about then. 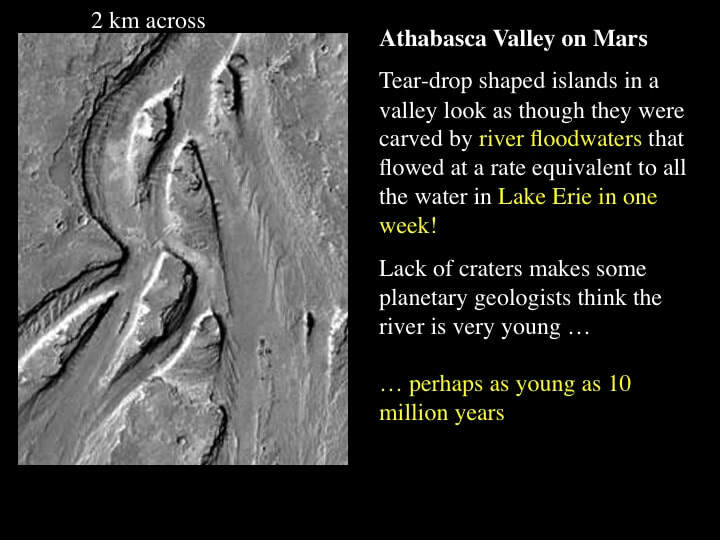 What about surface water on Mars in geologically recent time, say the last 10 or 100 million years ? This idea presents some enormous problems because of the very thin Martian atmosphere. At low atmospheric pressures, water turns into water vapour very easily, even at low temperatures. In a Martian atmosphere, 100 times thinner than the Earth’s, the scientific estimates are that surface water cannot survive for more than a few minutes ! 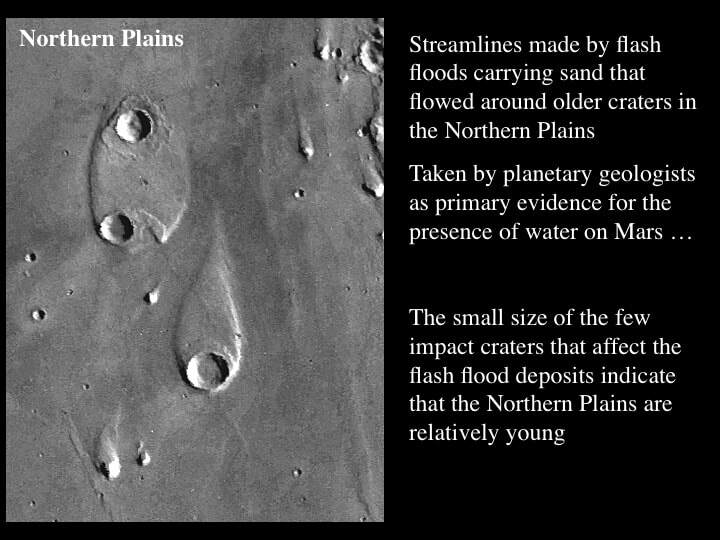 This means is that any geologically recent features created by surface water on Mars must have involved really fast flash floods. 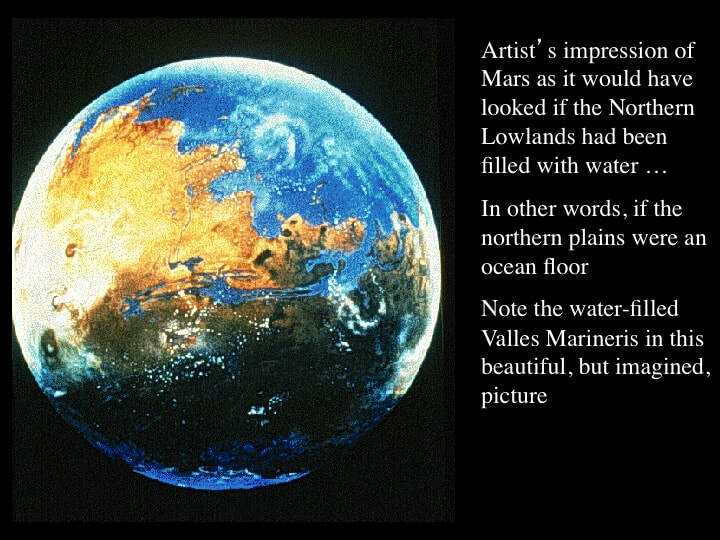 It also means that if standing water, such as a sea or an ocean, was able to survive on Mars for any extended periods of time, the atmosphere of Mars must’ve been much thicker than it is today in the early history of the planet. 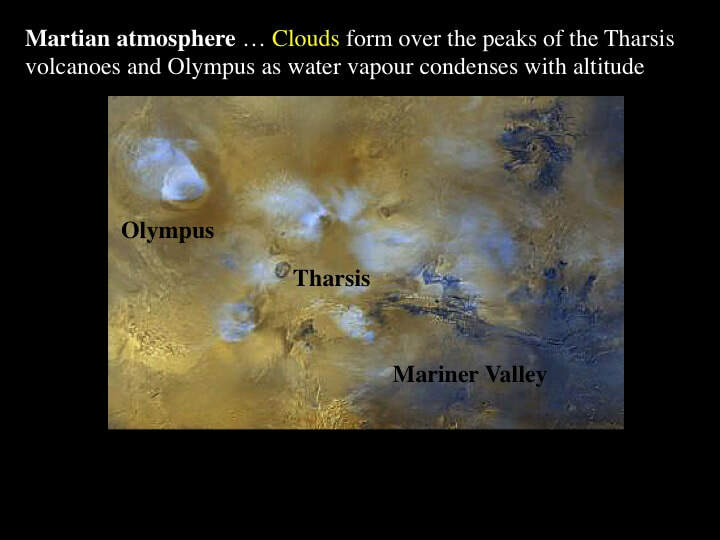 What are the visible signs that tell us that Mars has an atmosphere ? First, we can see clouds that form over the tops of the highest volcanoes, just like clouds that form over high ground on Earth. Second, we can see “sand” dunes in high resolution pictures taken by the various Mars Orbiters. 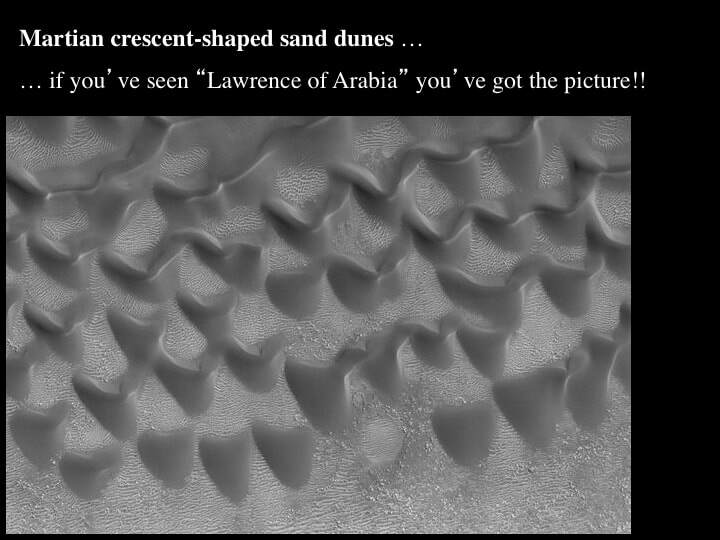 Dunes form and migrate when wind (which is evidence for an atmosphere) blows sand up the gently dipping slope and over the crest. The sand grains accumulate in the lee of the wind on the steep slopes. Knowing this, we can tell which way the Martian wind blows. 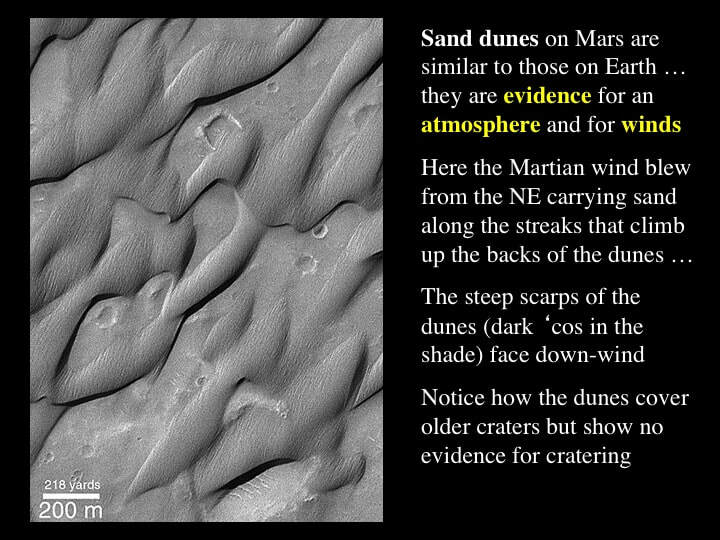 Furthermore, some dunes appear to be very young, as we can tell by observing that they cover some impact craters, but show no sign of impact cratering themselves. So, Mars appears to be a dry, dusty place where water can’t last long at the surface. 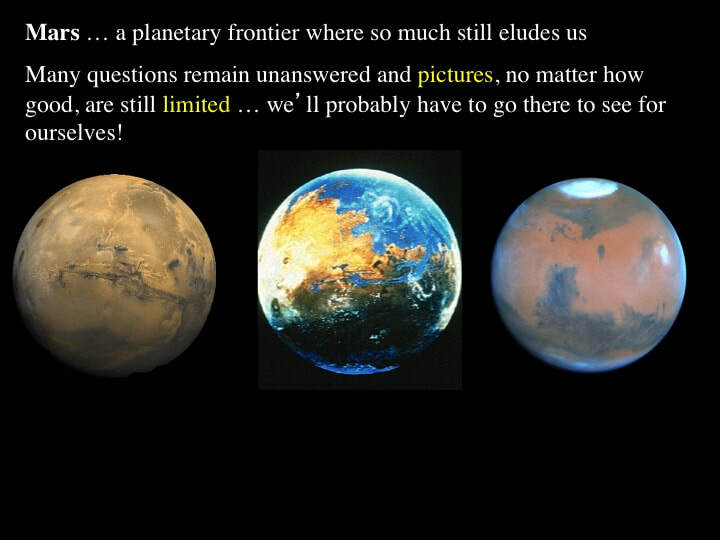 Yet we keep hearing about water on Mars; so where is it hiding ? Well, Mars is also pretty cold with an average daytime high of about -50°C, leading most planetary geologists to think that martian water is locked up in the ground as permafrost. 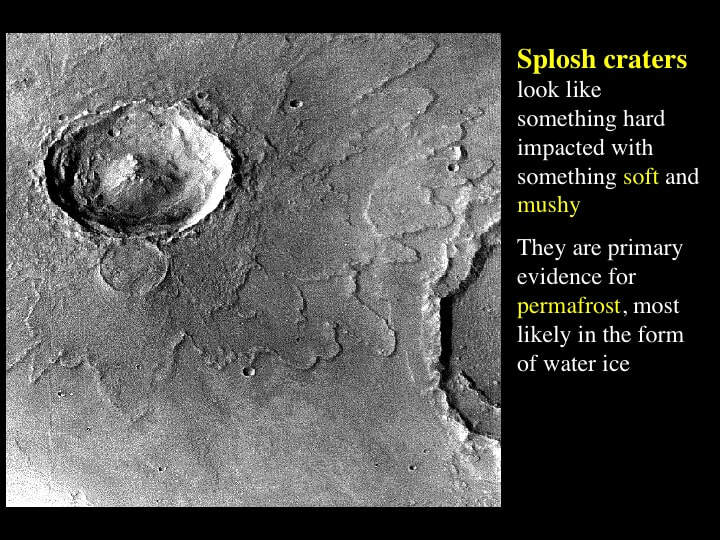 Characteristic Martian splosh craters that look like mud splashes constitute primary geological evidence for permafrost. 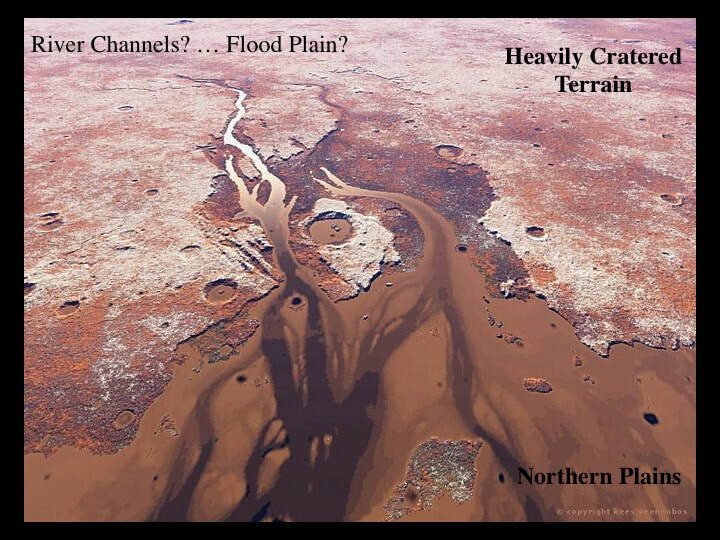 Some planetary geologists think that martian polygonal ground patterns are also characteristic of permafrost. 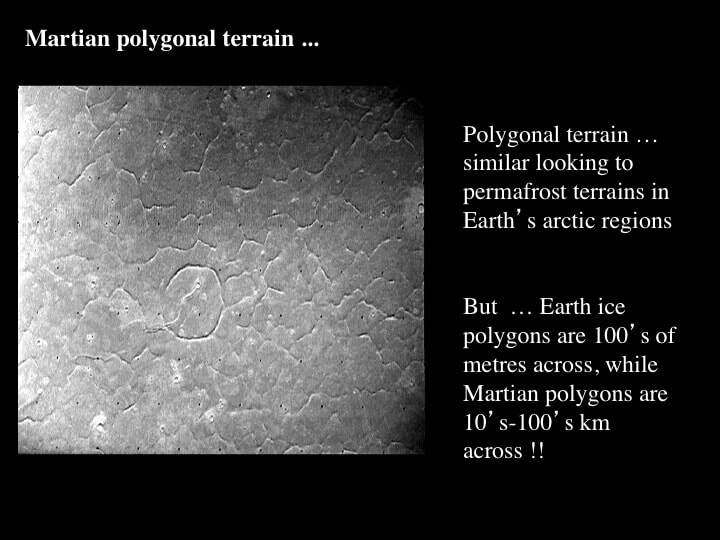 While there’s no doubt that similar polygonal shapes are found in permafrost terrains on Earth, the martian ones are up to 3 orders of magnitude larger than their terrestrial equivalents, so their interpretation remains ambiguous. 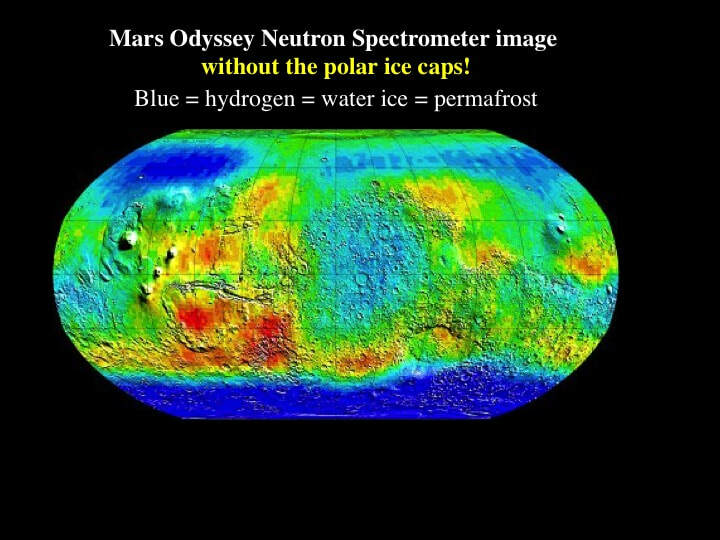 Whatever, it was no surprise to planetary geologists when the media highlighted the recent “discovery” of “water” around the south pole by the Odyssey satellite, now in orbit around Mars. In reality, what Odyssey detected was evidence for hydrogen. This is most reasonably interpreted as the result of water ice in the form of permafrost very close to the surface. However, the real significance of the Odyssey data is that they confirmed the existence of permafrost on Mars, and showed us where it is presently concentrated. Which brings us to the polar ice caps. 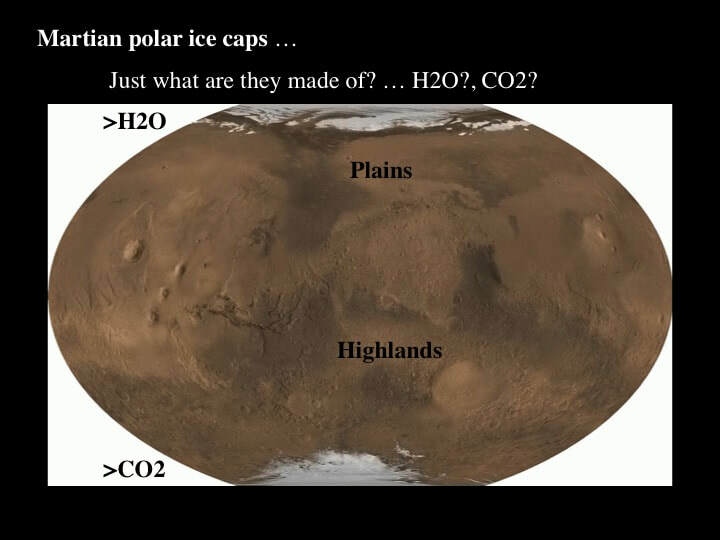 The martian polar ice caps are very different from their equivalents on Earth. Basically, the northern ice cap is mostly made of water ice, while the southern one contains a lot of frozen CO2. The northern ice cap is large and thick, up to a kilometer or so with a bit of CO2 frosting, while the southern ice cap is smaller, thinner, and shows large variations in size from season to season due to the formation and sublimation of a widespread, but very thin layer of frozen CO2, only 10’s of centimeters thick. This is one of the most fascinating features of Mars that was explained in a short article in the April 2002 issue of the RASC Journal as due to two main factors: (i) summers are hotter and winters are colder in the southern hemisphere as compared to the northern hemisphere, and (ii) martian topography is higher in the south than in the north. As on Earth, seasons occur on Mars because the planet’s rotation axis is tilted with respect to the ecliptic, which is the plane in which the planets rotate around the Sun. Furthermore, the martian orbit around the Sun is slightly elliptical, such that summer in the southern hemisphere coincides with the time when Mars is at its closest point to the Sun. Therefore, summers are hottest and winters are coldest in the southern hemisphere on Mars. What this means for the martian southern polar ice cap is that lots of water ice turns into water vapour in the summer, and is replaced by frozen carbon dioxide frost in the winter. So, the question now is; “where does that lost water ice go?”. Answer ? ; it goes down hill ! Remember that the martian southern hemisphere is dominated by Heavily Cratered Highlands, while the northern hemisphere contains the Northern Plains or lowlands. According to new planetary climate modelling, this difference in topography drives planetary air circulation from the South toward the North, carrying the water vapour away from the southern polar ice cap and depositing it as water ice at the north pole. The big question here is how long has this weather system been the way we see it today? Is this the explanation for the concentration of water ice in the northern polar ice cap ?